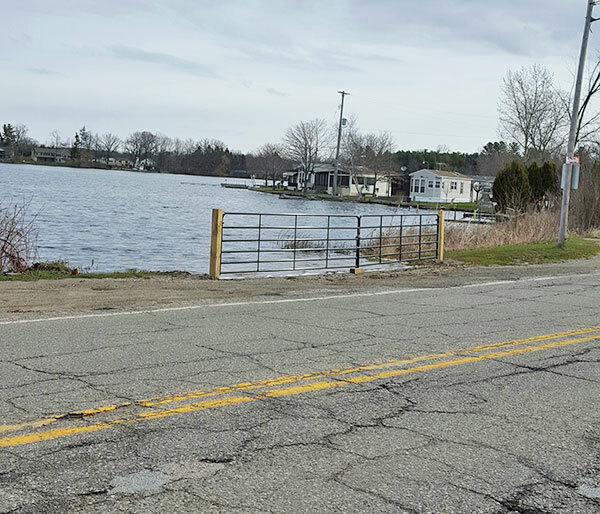 Why is there a gate on Sand Lake boat launch? People in the area have been using the boat launch on 22 Mile at Sand Lake to get their boats in and out of the lake for as long as anyone can remember. So many people were surprised when it was gated and locked the first part of March. The Post fielded some questions from readers about it, and contacted the Village of Sand Lake to find out what was going on. According to Sand Lake Village President Roger Towsley, contrary to what people might think, it is not a “public” boat launch. Instead, it’s part of the thin strip of property at 551 W. Lake Street, that runs to the west of the boat launch. “The person who used to live there allowed the public to use it, and the people before him never minded,” explained Towsley. “I’ve lived here 40 years and it was always used. Others have told me that it’s been in use since the early 1900s.” The Village has helped maintain the property by putting gravel in there and mowing it. He said that the problem is that when the property was sold, the new owner became concerned about the liability of people using it, and decided to put up the gate. Towsley said that the Village of Sand Lake has spoken to the owner and asked if he’d be willing to sell the east end of the property to the Village, so that the public could use the boat launch. “He said he would be willing to do that. We just need to get it appraised,” said Towsley. Towsley also said that they had contacted the Village of Sand Lake’s insurance company, and that their insurance would not go up. “As soon as we get a price, we can make an offer, and hopefully open it up to the public. The offer will depend on the assessment, and whether we have the money.” He noted that they would be open to taking donations for the project. “If we can buy it at a fair price, we will,” he said. « What’s “bugging” you in our streams? This access should be legally ruled Prescriptive “Grand-fathered in” as it has been more than 15 years. Tax payers should not have to purchase this land.